This album has a lot of great songs. It’s essentially country music, but there are some moments that move beyond that. It never moves beyond quality sounds, too. 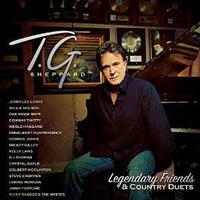 Add in all the great guests, and this is a “must have” if you like country music. Old school country music with a great vocal arrangement is the order of business here. The multiple layers of vocals are effective, and this an old time gospel song with a bit of a modern flair. Suitably old time rock and roll based, this is a fun cut. I love the guitar solo on this thing, and the duet works really well, too. Here we get an old time country gospel tune. It’s a ballad and is delivered in style. Another country ballad, somehow this feels a bit like Jimmy Buffett to me. This energetic tune is a lot of fun. It has a suitably Latin arrangement to it. It’s one of my favorites here. I really love this song. It’s a mellow ballad. It’s also a full on old school jazz treatment. It’s just so tasty. The vocals really steal the show, but the piano tries hard to change that. Starting with the sounds of a storm, this is more soft rocker than it is country. Sure, there is a country edge, but overall, this feels like 1970s rock. It’s also one of the strongest pieces of the disc. An old time rock and roller, this is fun. It’s got a lot of energy. The lyrics are entertaining, and the duet works well. This is an old time country ballad. It’s also a particularly strong number. A mid tempo song, this isn’t quite a ballad, but it’s not really a rocker, either. It’s very much set in a modern country motif. It’s also a very potent piece of music. A more traditional country arrangement, this is more of a power ballad in that vein. I like this cut a lot. Then again, I like Willie Nelson quite a bit. This classic gets an adult contemporary styled treatment here. It’s very effective. I like this cut quite a bit. It’s another that feels like an adult contemporary treatment. It’s just a very pretty duet. This is a very pretty ballad. I normally think that it’s not the best move to put several ballads together like we have at the end of this disc. These are so strong, though, that it really works.